Hope you are doing well. Just a quick update. Curtis and his team will be crossing the border from Saskatchewan to Manitoba today. After a bit of a drive this morning – Curtis will be riding from Fleming to Brandon Manitoba where the Gary & Judy Edwards have provided for the Teams need. Thank you. Tomorrow they will continue on to Winnipeg where Gregg & Leanna Filmon are providing for their needs. They have also arranged for a group of their friends to join them and hear Curtis’ story. Thank you. Please keep the team in prayer as they continue to have open doors to sharing. Below is another short video clip that the team has put together – please take the opportunity to share this with others. Thank you for all you have done or are doing in support of Curtis, the Ride for Promise and UrbanPromise Toronto. We appreciate you. The team made it through the mountains and arrived in Banff AB last evening. It’s hard to believe that they have made their way through British Columbia already. In talking with Curtis last night, they were thankful to be in Banff and they were setting up camp for the evening looking forward to some rest and getting ready for today’s trek. Which takes them from Canmore AB to Calgary AB, right in time for the Stampede. Curtis is anticipating a good time tonight with the opportunity to share his story with a group of friends that the Guebert’s have invited. Thank you to the Guebert’s for hosting the Ride for Promise team. We have seen several donations from people in Calgary which Curtis states are from those who cannot attend tonight. Please pray that today’s journey will go well and that God will continue to speak through Curtis as he shares his story of hope. Below is a link to a New Canadian Media – The Pulse of Immigrant Canada article that was shared on my newsfeed on Facebook. The article titled “Social Housing Shouldn’t Define Me” written by Sam Minassie in Toronto, shares about Curtis, his life story, and the Ride for Promise. I continue to be amazed by the unforeseen open doors that keep coming Curtis’ way as he continues in faith on this journey to share God’s story in his life. Please don’t hesitate to share this with family, friends, and many others in your circle of relationships. You are our best advocates. Thank you all for blessing Curtis and the Ride for Promise team as well as UrbanPromise Toronto. Our hearts are full of gratitude to each one of you. What will Happen to the Ministry we Support? It has been an honour to work with missions advocates over the years and we want to thank you for your dedication to missions! For more than a century, Christian Reformed churches have been introducing people to Christ in North America and abroad through Home Missions and World Missions. We are so grateful for your church’s partnership! Through missionaries, church planters, and ministry leaders here and around the world, your congregation is making a far-reaching, eternal impact. Your partnership is tangible proof that you believe in a God without borders. Announcing Resonate As you may have heard, Synod 2017 just approved a name and director for the new mission agency and we are excited about our future as Resonate Global Mission under the leadership of Rev. Zachary King, a longtime missionary to Haiti. This idea of a ‘Resonating’ sound isn’t just a metaphor for our work, it’s a picture of the future we pursue—living out and sharing the good news so that it goes out in every direction like an expanding, amplifying sound. As our two agencies come together, we understand how important it is for you to be able to support the ministry that matters the most to your church. We’ve ensured that you will be able to continue to give to either international or domestic ministry (or hopefully both!) and we will apply the funds exactly as you specify. We also want to reassure you that the ministry work your church has stood behind will continue. In addition to the ministries that you are familiar with, we anticipate new ministry opportunities to engage with as Resonate Global Mission leverages the benefits of bringing “home” and “world” together. With your prayers and financial support, we will be able to equip all our churches for ministry and join together with what God is already doing around the world. If you have additional questions or concerns about your giving, please contact Trish De Jong at tdejong@crcna.org or (800-730-3490). Resources for the Future This will be the final Missions Advocate newsletter that you will receive from CRWM. Resonate Global Mission will continue to provide you with helpful resources. In the meantime, you can continue to visit the resources page on CRWM’s website as well as the Global Mission section of the Network. Ministry Openings With the new agency and new fiscal year on July 1, also comes a number of new ministry positions! As Christian Reformed World Missions prepares to become Resonate Global Mission, so too comes an end to what is currently the Canadian Missions Network (CMN). The CMN is concluding on June 30, 2017, as Resonate launches on July 1. Much of what we learned through the CMN will provide a foundation that will continue through Resonate. Even before Resonate was on the horizon, we recognized the desire for churches to receive resources through a regional delivery system. Responding to this desire, staff developed the CMN to increase connections with congregations. Since then there has been an increase in the number of church engagements and presentations, conversations with pastors and ministry leaders, and a rise in congregation Missions Committees/Global Outreach Teams. We feel privileged to have walked alongside many churches as they have deepened their interest in global missions, and their partnership with our ministry. In July, that work will continue in Canada through Resonate’s regional teams, under the leadership of Rich Braaksma and Kevin de Raaf. Rich (pictured above) will serve the western Canada region, which includes Alberta and British Columbia. Braaksma is currently a pastor at The Road Church, in Calgary, Ala. Kevin will lead the eastern Canada region, which includes Ontario, Quebec, Newfoundland and Labrador, and the Maritimes. DeRaaf will lead the region with his wealth of experience in classis leadership and church renewal along with his 24 years Thank you for your faithful prayers on behalf of God’s mission to His world. The Future of the Canadian Missions Network of combined experience as a lead pastor in Ontario. As a Missions Advocate reader, you have played a valuable role in the Canadian Mission Network. We look forward to continuing to partner with you for mission through Resonate. Thank you for your ongoing ministry to raise awareness for missions in your church and care for your church’s missionaries! A Special Thank You Both Bill and Ko Spyksma and John and Margaret den Otter will be retiring from their positions in the CMN. We are so thankful for the ministry of Bill & Ko and John & Margaret! They have been a tremendous blessing to churches, missionaries in their years of ministry—including the extra year that they graciously committed to in order to ease the transition to Resonate. We wish the Lord’s blessings as the Spyksmas and den Otters close this chapter of their lives, knowing that missions is very much part of their hearts and passion. If you have an opportunity, please feel free to drop them a word of congratulations. URBAN PROMISE – RIDE FOR PROMISE: Curtis Carmichael as a youth grew up attending the Urban Promise program and as a teen made the decision to follow Jesus. He has been involved with Urban Promise over the years and now has become a teacher with a desire to serve the marginalize people (children) of Toronto. God gave Curtis the vision to bike across Canada to raise awareness about the ministry of Urban Promise and has set a goal to raise $150,000.00 for the organization in light of Canada’s 150th Anniversary this year. Curtis will be arriving in Barrie on Tuesday July 25th finishing a leg of his journey that will take him from Port Carling to Barrie that day. We have arranged for a speaking opportunity for Curtis at Covenant Christian Reformed Church for 7:30 pm on Tuesday July 25th. We would encourage the members of the congregation at Covenant to come out and hear Curtis’s testimony of his life growing up under the influence of Urban Promise and what it has meant to him. An opportunity will be given to financially support Curtis’s mission of raising funds for Urban Promise at this meeting. You can get more information on Curtis’s ride at: www.urbanpromise.com/ride/ and there is also a tab at this website where you can make donations as well. Urban Promise is a charitable organization so tax receipts will be issued for donations made to the organization. We are also looking for someone to billet Curtis with the team that he is travelling with. There are 4 men in total that will require a place to sleep for the night on Tuesday July 25th. If you can billet 2 or 4 of the men that would be most helpful. They would arrive for the evening following the meeting at Covenant church and will be up early the next morning looking for breakfast from their billet. If you can help with the billeting then please contact Henry and Corrinna Kiezebrink at either utopiapines@hotmail.com or by phone at 705-737-3135 or in person at church. We look forward to a great turnout to the meeting. Invitations will be going out to many other individual supporters and supportive churches of Urban Promise in the area. Janelle Jong (nee Kiezebrink) will be contacting these people and churches to invite them to this meeting as well. Please spread the word to support this effort by Curtis to promote and support an organization that does so much for the Kingdom work of God in the marginalized communities in Toronto. You couldn’t have wedged a single other piece of furniture into our living room, and we didn’t have anything left to wedge in anyways. It was full. We had our dining room table, two housemates’ desks, a card table, and our coffee table all lined up the whole length of our house. Every chair we owned, including someone’s rolling desk chair and the bench we use to take our shoes off in the front hall, was squeezed in. We still weren’t sure if there would be enough places at the table. It was Easter, and it was time to celebrate the resurrection. Except we didn’t feel like celebrating. Our friend Ron had just passed away two days ago. We were shocked and sad and exhausted. Sitting in church that morning, I cried. It seemed like the resurrection was very far away. But we knew we had to proclaim Jesus’ power and grace and aliveness even in the face of death, so we reluctantly started cooking when we got back from church. Six o’clock came. People poured into our house. We didn’t know half of them. My students had been inviting their nonbelieving friends over for dinners at our house for the past six weeks, and now, halfway through exams, they were apparently on top of their game even if Alix and I weren’t just then. We ate, we laughed, we ate some more. We counted heads. Forty people. We did a little dance. We decided next time we would cook two turkeys. Two first years came to say goodbye at the end. After we finished doing the dishes and put all our desks back we collapsed onto the couch, glad we did it after all. Glad that we had made a stand for resurrection, invited people into life with Jesus, where there is a place at the table for everyone, even if it is in a desk chair. Especially when it’s in a desk chair. 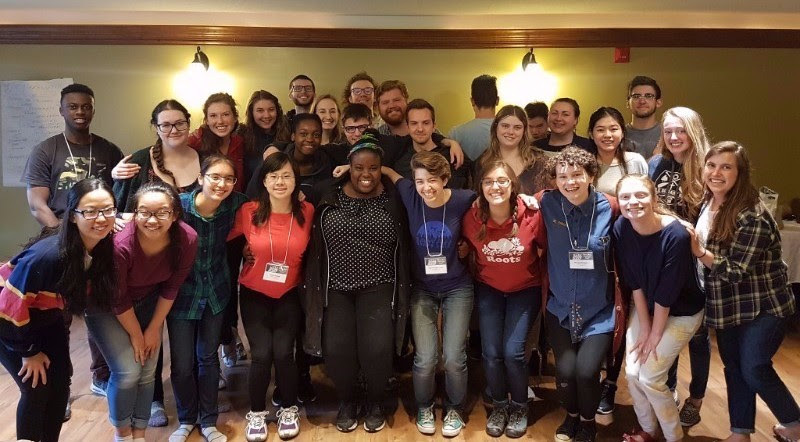 Grief and grace all swirled together – this is the experience of our ministry at Queen’s over the past semester. We’ve grown some, we’ve lost some. We’ve weathered some rough times. And yet, that Easter – that was a gospel day. That was a day when Jesus was here and now and present among us, very much alive. That was a time when the Kingdom of God came down into our living room, desk chairs and mismatched plates and all. MARKcentral, our conference on the gospel of Mark, was pretty much gospel days all the way through – it was that good. My favourite moment was lying outside and looking at the stars with my nonChristian housemate, who was in my class. “You know, he’s pretty cool. I don’t think he’s perfect or anything, but I think he has really good things to say,” she replied. “What were you thinking about today when we shared about applying Scripture?” Cara had been silent in our group sharing time. But now she opened up to me more than she ever had before. Cara, a professed atheist, could see herself in Scripture and see that Jesus had a good thing to offer to her! Praise God for the change in her life over the course of this year. “So, Ahirim*, have you done any fun things since you came to Ottawa?” Raina* asked this question casually one afternoon, filling space between tasks. Raina’s eyes filled with tears as she told me this story. Ahirim is a Muslim refugee from Djibouti who was living at the shelter where some of us were volunteering during our urban missions project in May. Raina is one of our student leaders at Queen’s. So we resolved to have fun with Ahirim while we were still there. We listened to music together. He shared his favourite songs, we shared ours. We baked cookies. And we got to share about our faith in unexpected moments, while we cleaned and chilled dough and ate our lunches together. Many of our students had similar experiences realizing the dearth of relationships in many people’s lives. At the refugee shelter, at the furniture bank, at the home for men with mental illness, they saw the result of relational poverty. Nobody to help carry a new couch into your apartment. Nobody to go to the tulip festival with. Nobody to give you a drive to your lawyer’s appointment. I got a text from another student a month after the trip. She had decided to continue helping out at the refugee shelter, babysitting two young children for their mother who is alone in Canada, and visiting with Ahirim. Praise God that the long-term relationships we hoped for are being formed. I mentioned in my last update that I had moved; my new address is 146 Clergy St E, Kingston, ON K7K 3S3. I now live in a big old manse owned by a very generous Presbyterian congregation. Praise God for this new partnership for Alix and I in Kingston. Many blessings on you and yours during these summer months! For our student leaders’ retreat next weekend – that our planning for next year would go well. For my fundraising this summer. My goal is to raise $10,000 by August 31! If you would like to give to our ministry, you can do it here. For our future first years coming from across Canada and even the world.